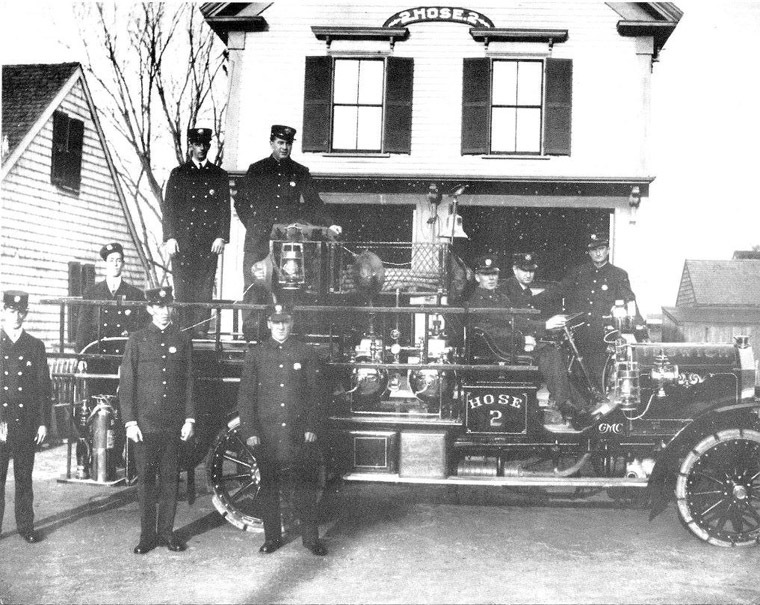 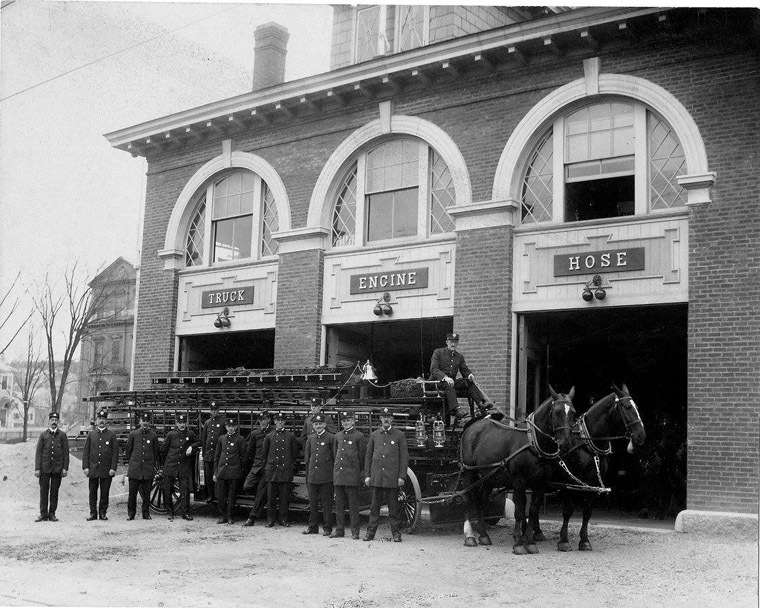 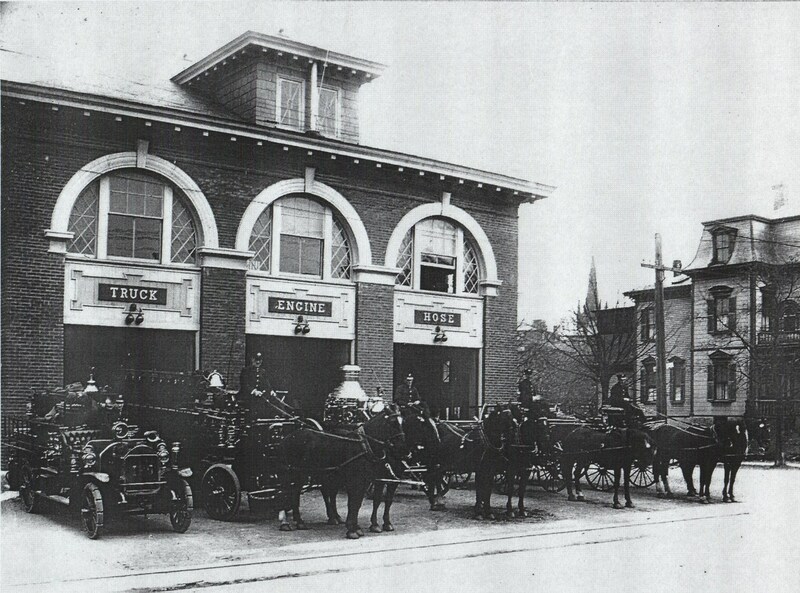 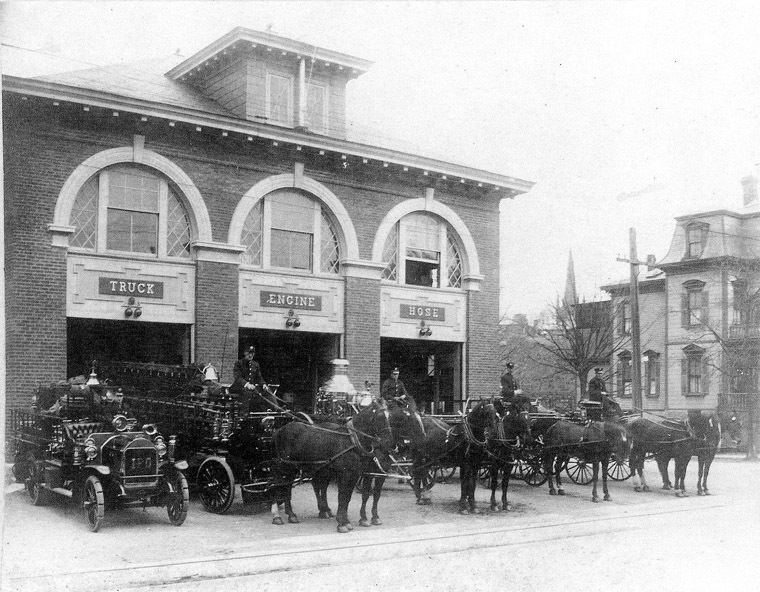 The fire station on Central Street in Ipswich was built in 1907, replacing the fire house at Lord’s Square. 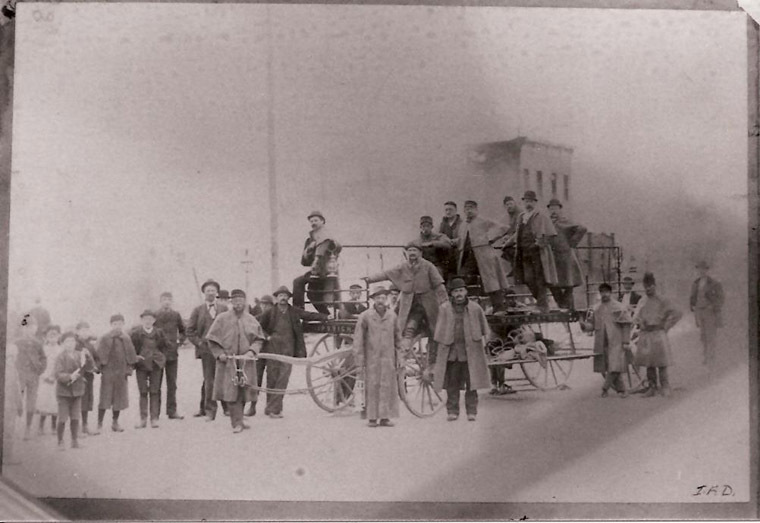 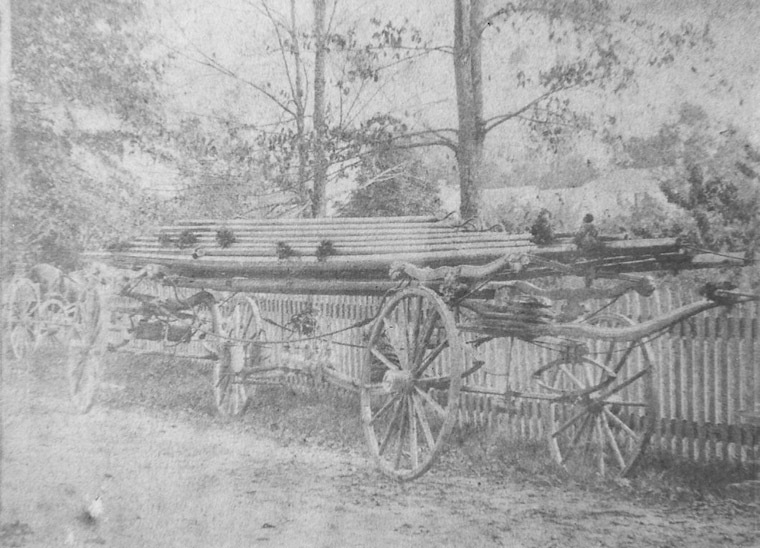 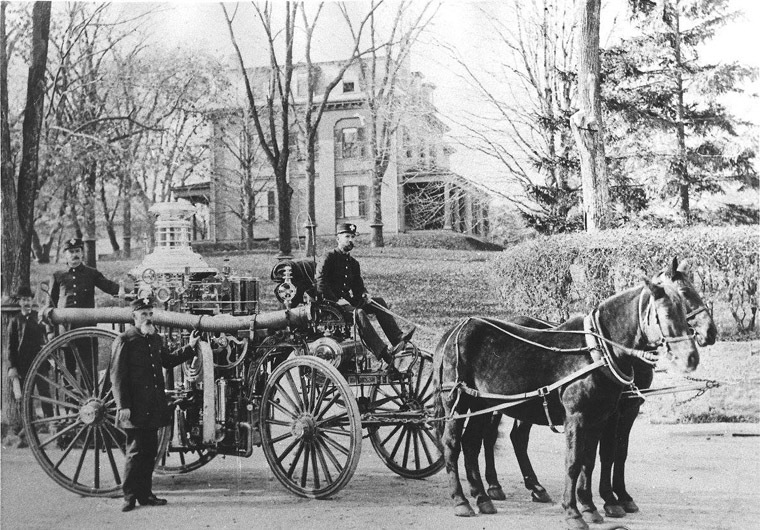 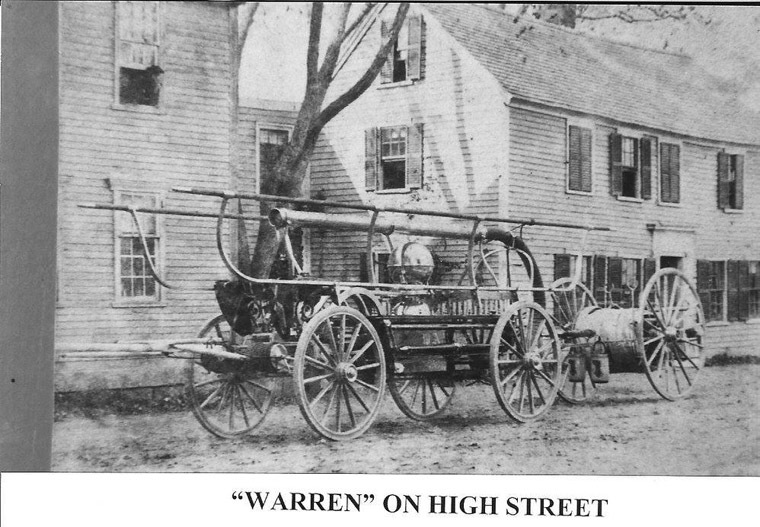 Originally built for horse-drawn equipment, it took over the work of the smaller departments at the Old Town Hall, Warren St., Candlewood Rd. 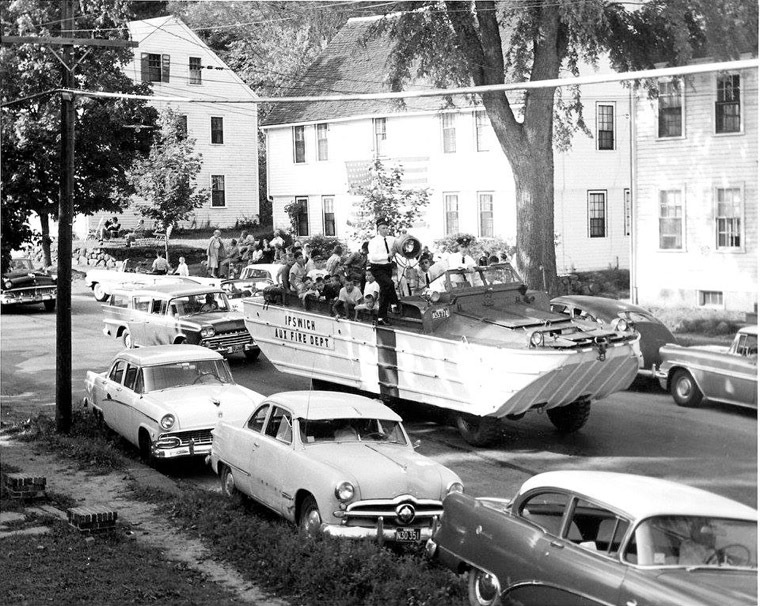 and several other locations in town when it became motorized. 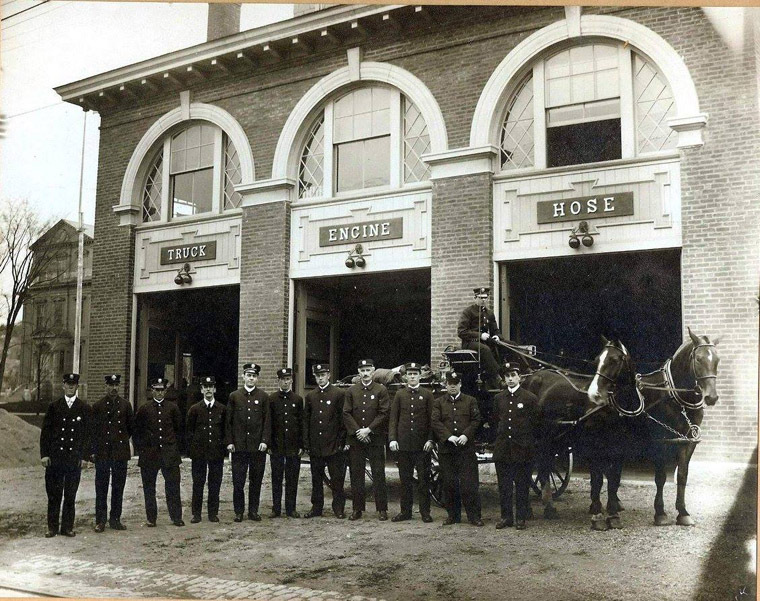 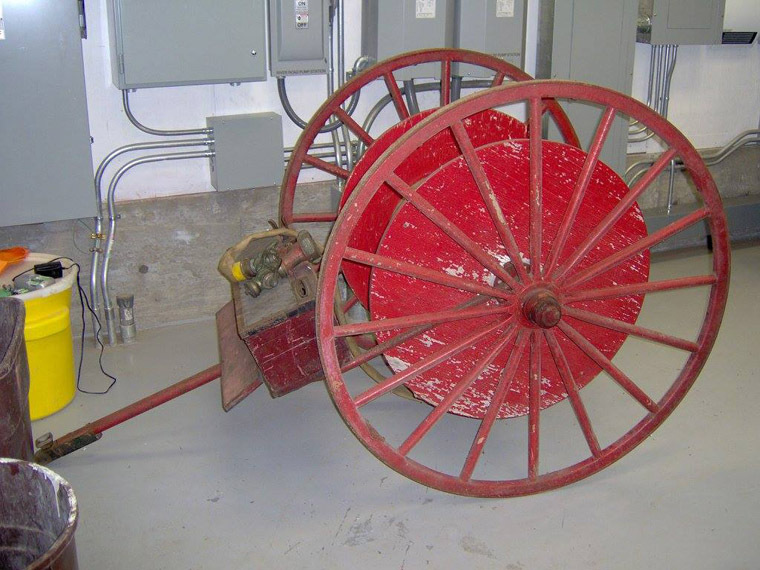 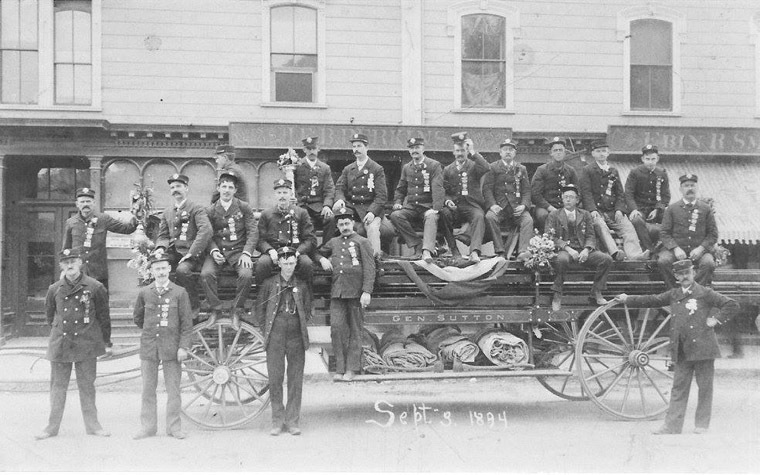 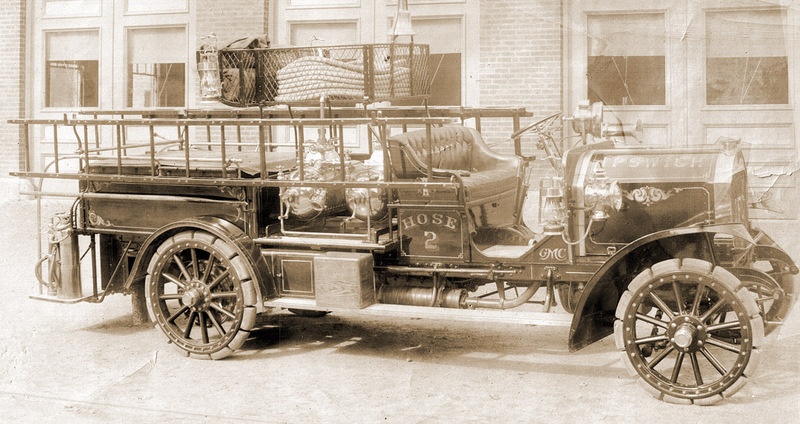 For over a century, the building has served as the town’s continuously-staffed fire station. 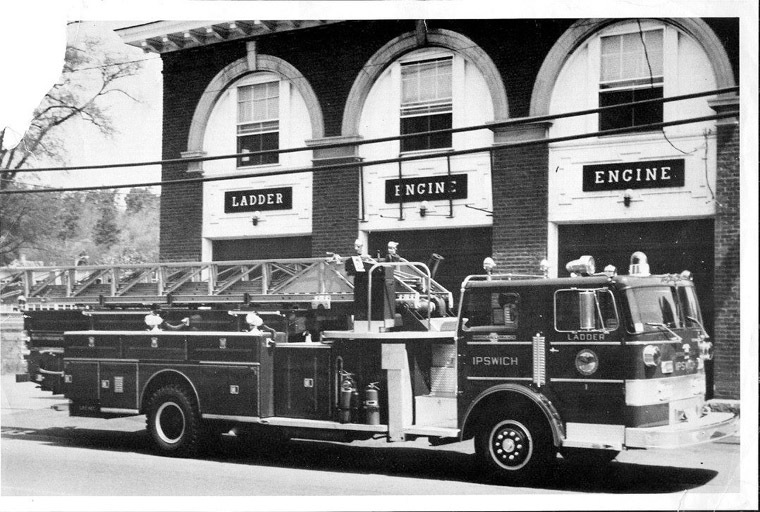 Featured image: postcard of the Ipswich Central St. Fire Department building, with the Manning School on the left. 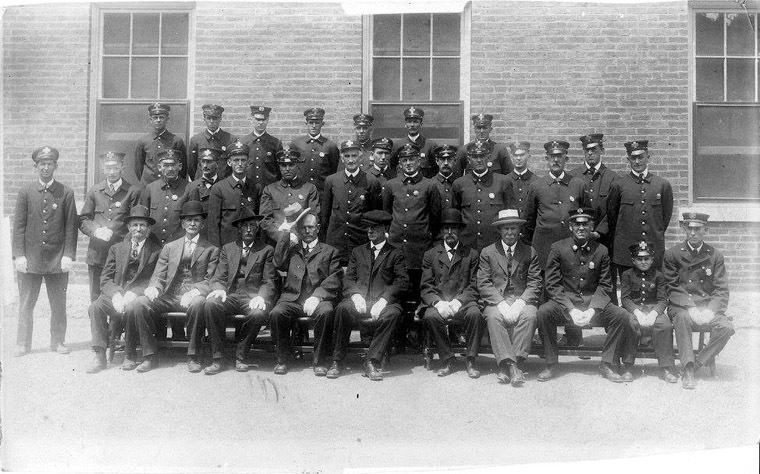 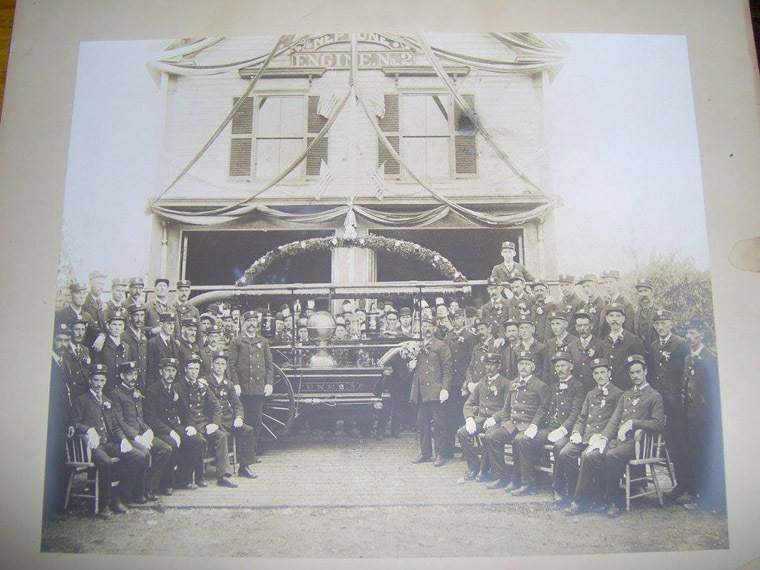 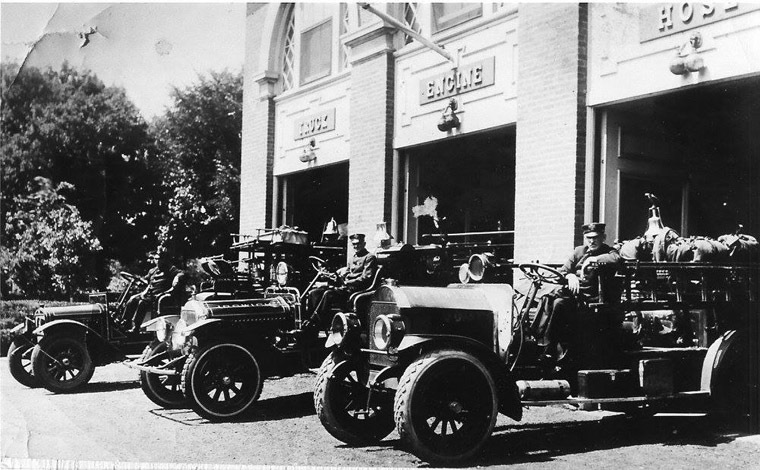 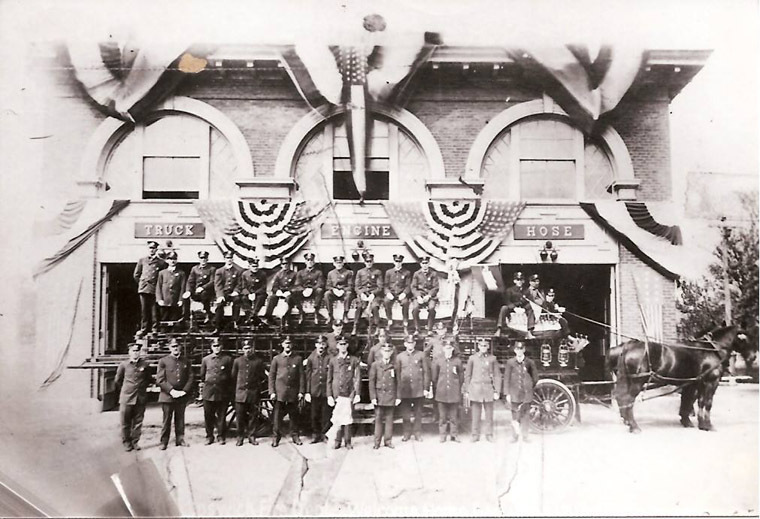 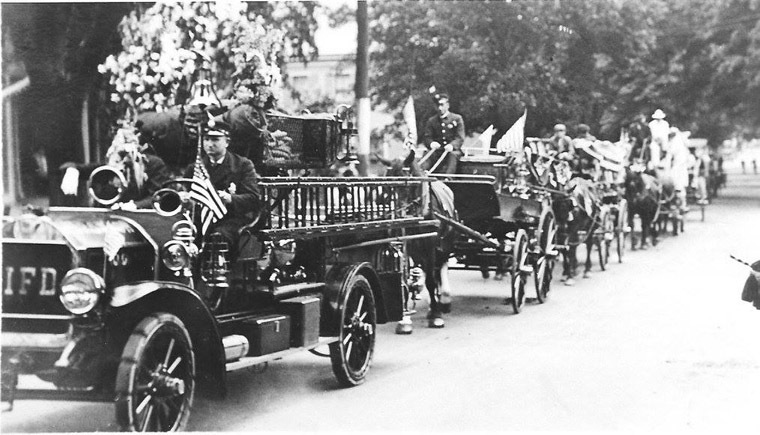 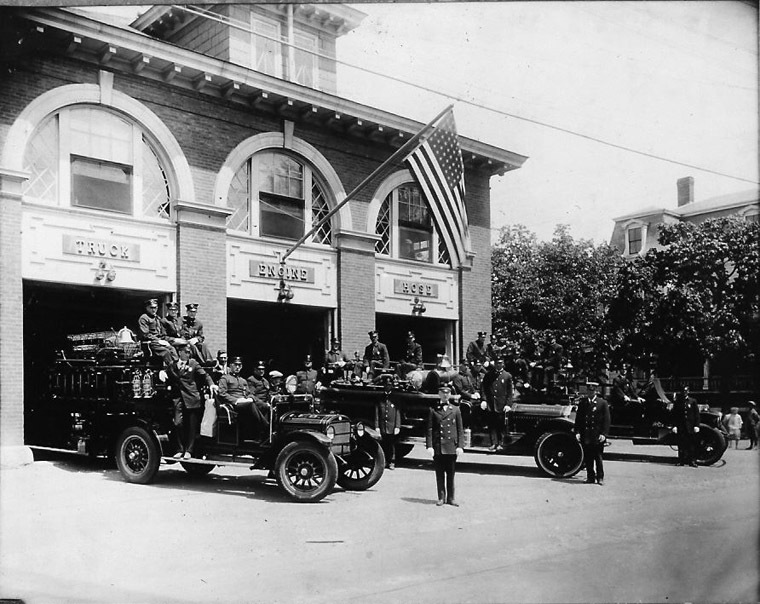 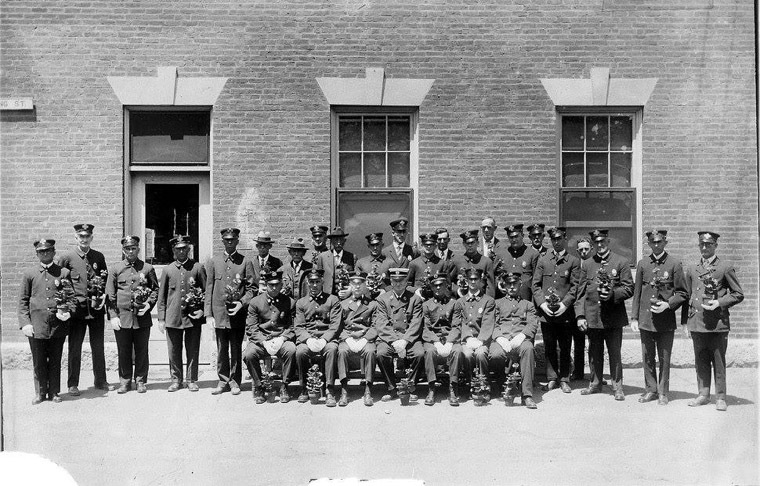 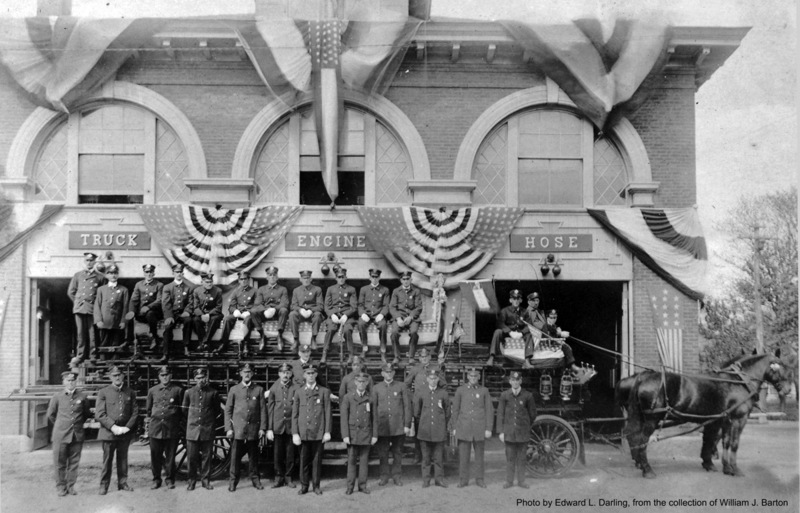 Dedication of the new fire station, 1910. 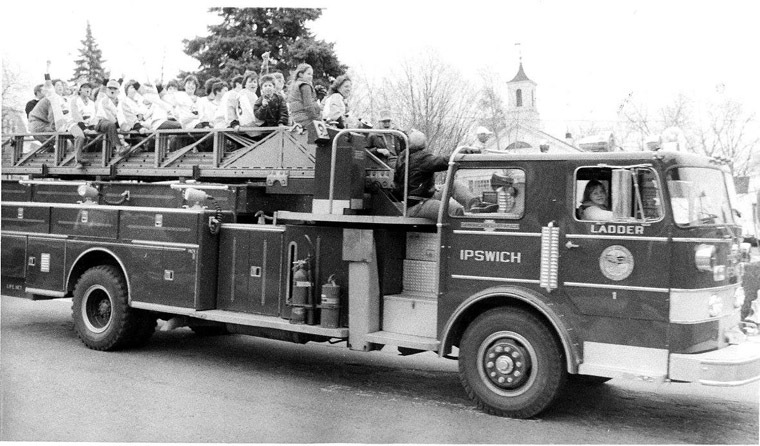 Photo provided by the Ipswich Museum. 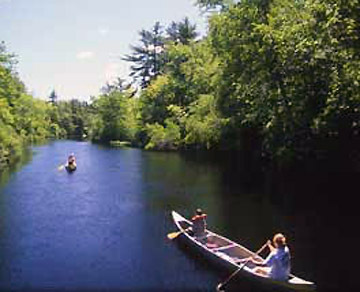 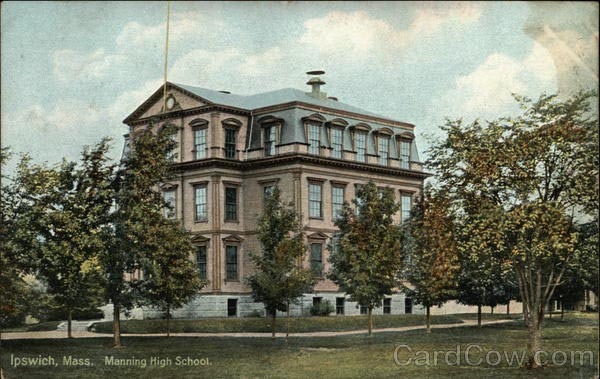 The Manning School can be seen on the far left. 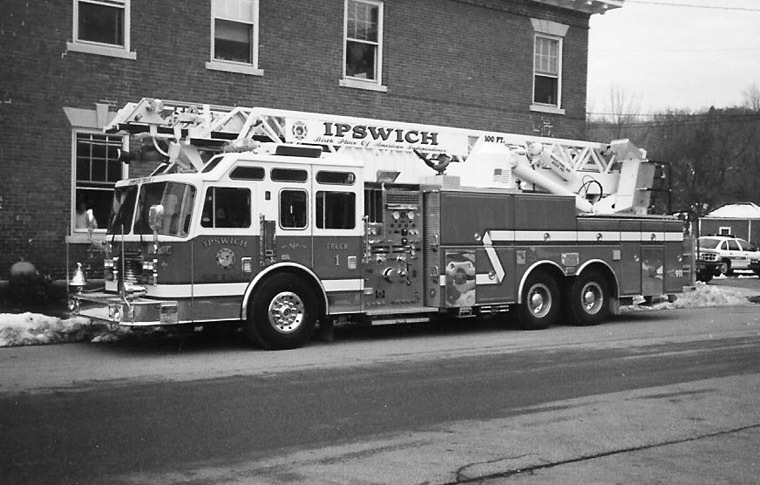 Photo provided by the Ipswich Museum. 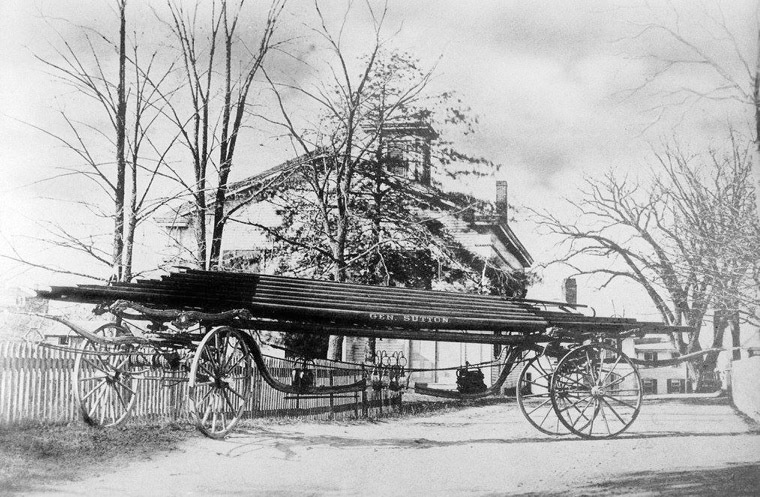 On the right is a house that once faced Central St. 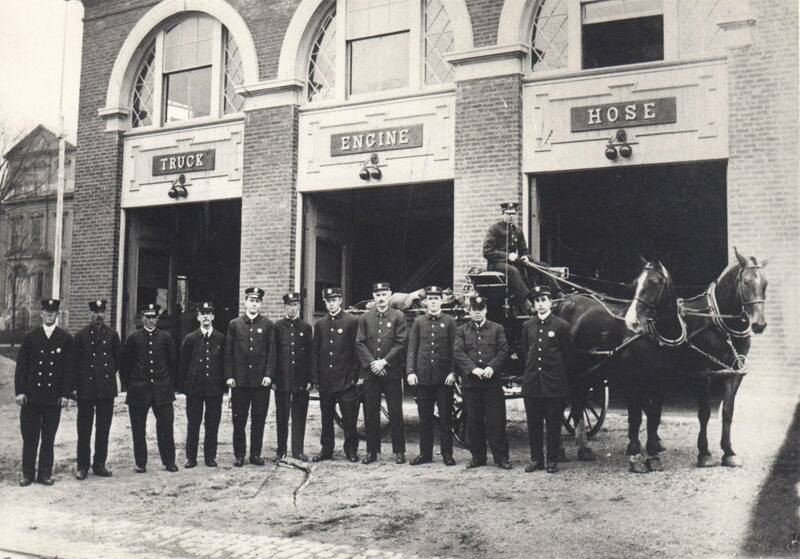 It was moved to the next lot on Manning St., and John’s Citgo sits at the original location now. 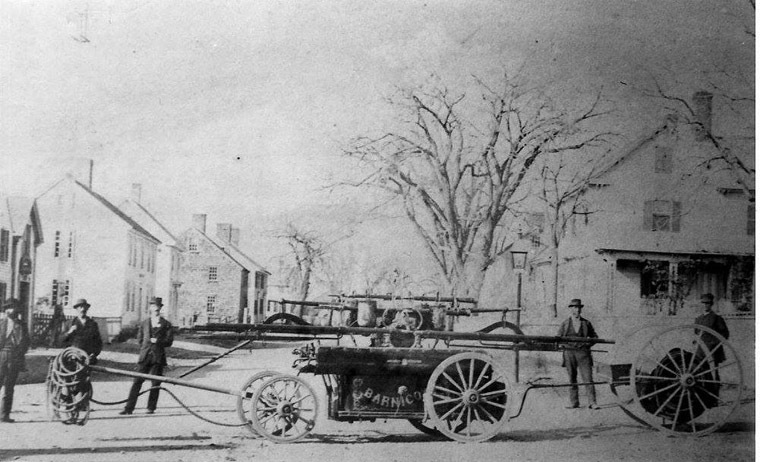 In the background you can see the steele of First Church, which burned in 1965. 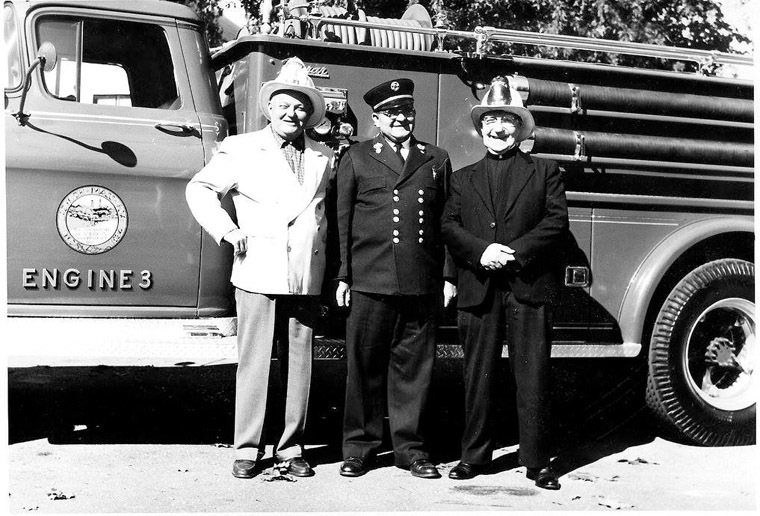 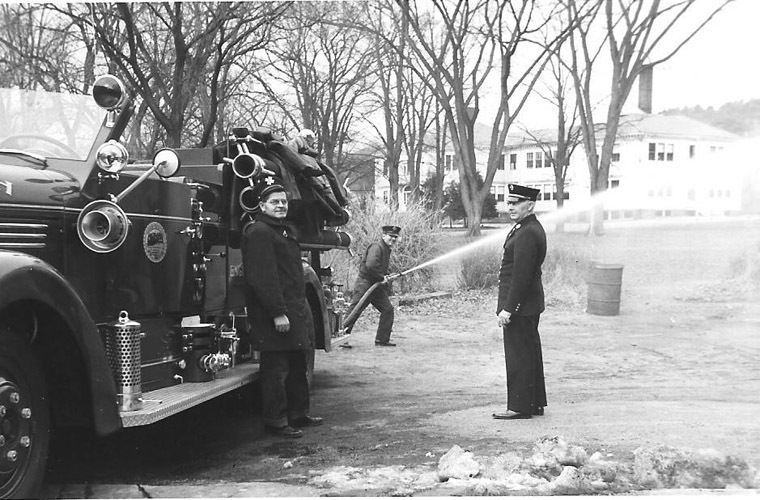 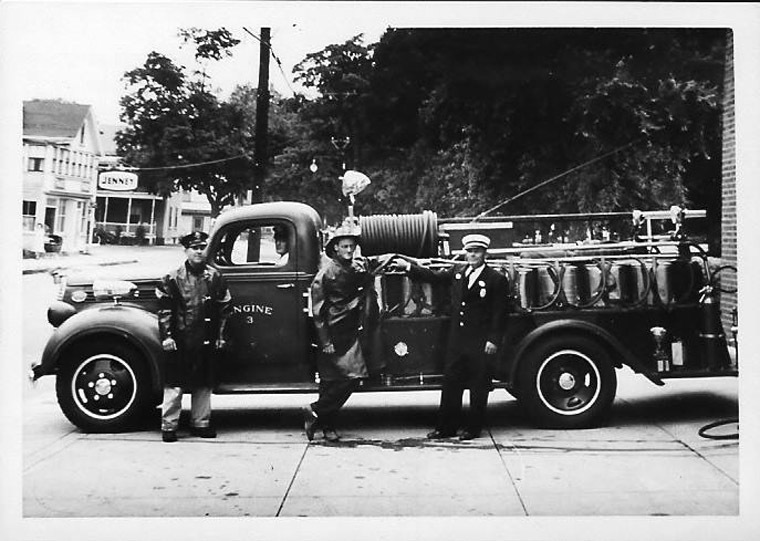 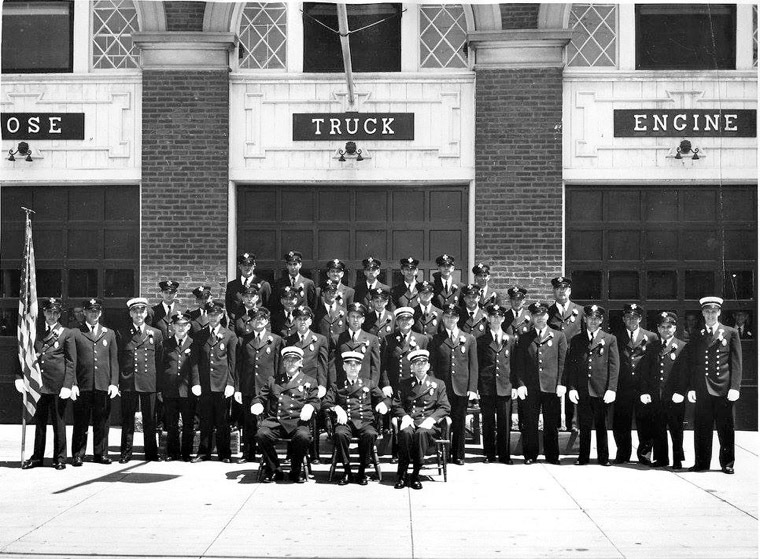 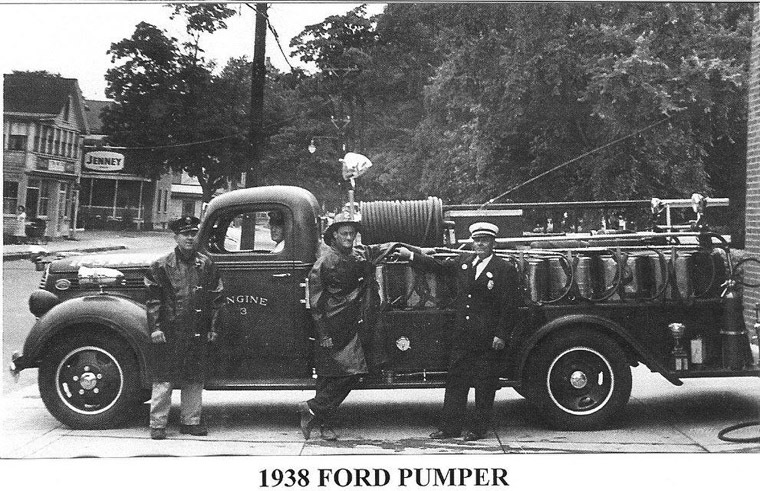 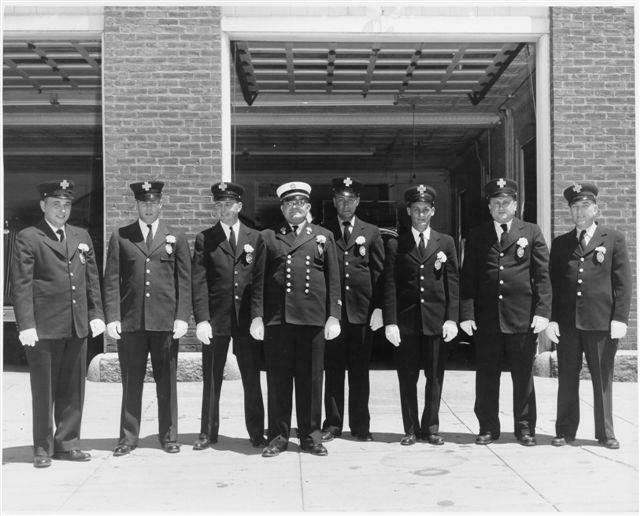 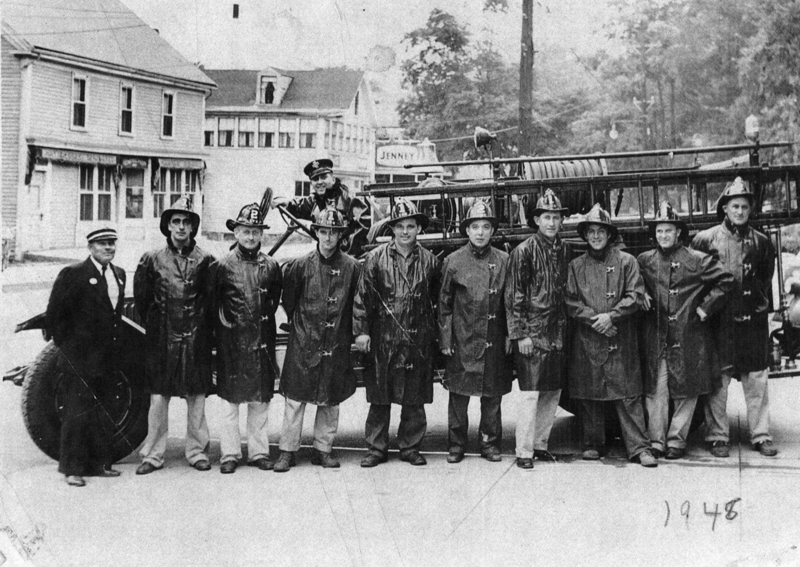 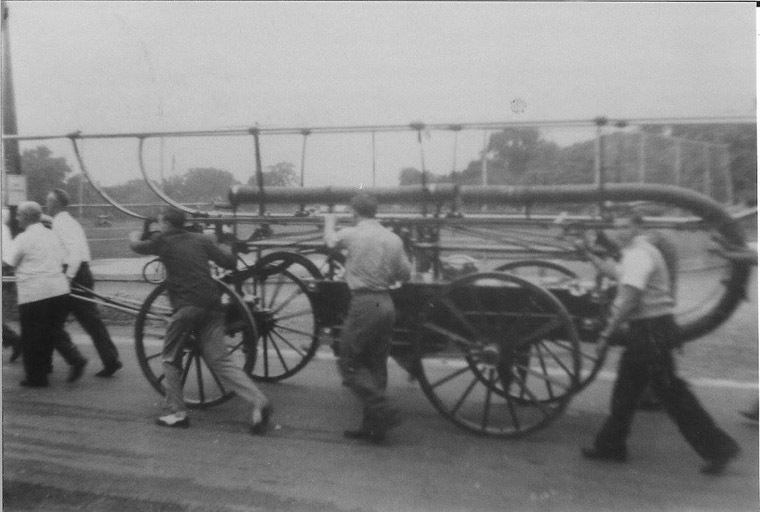 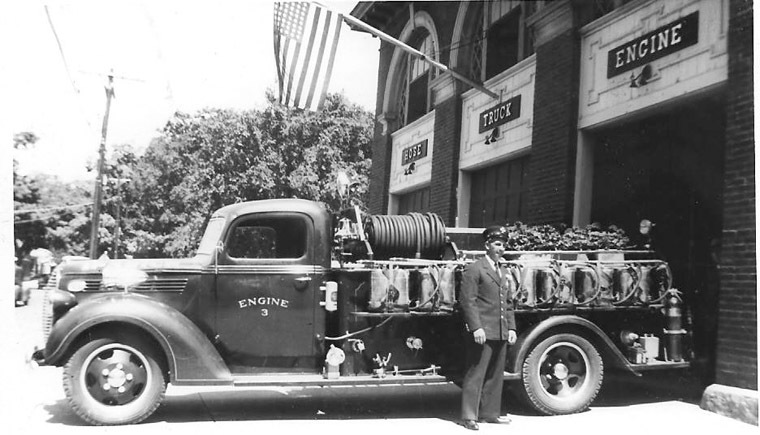 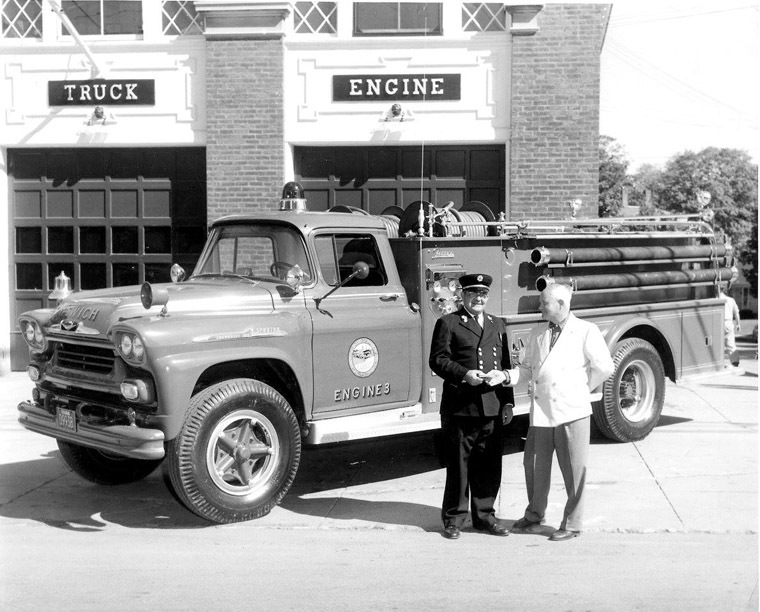 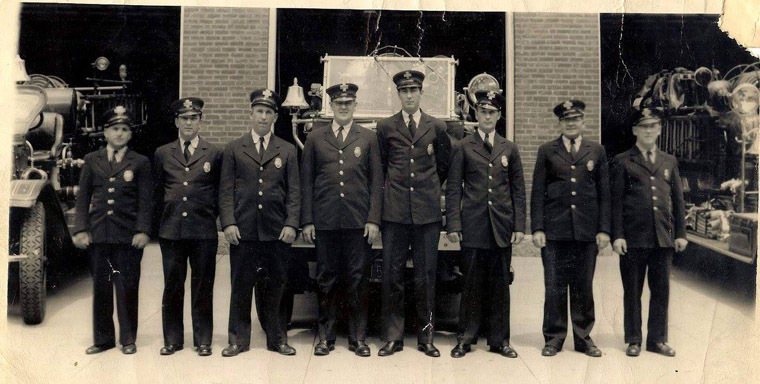 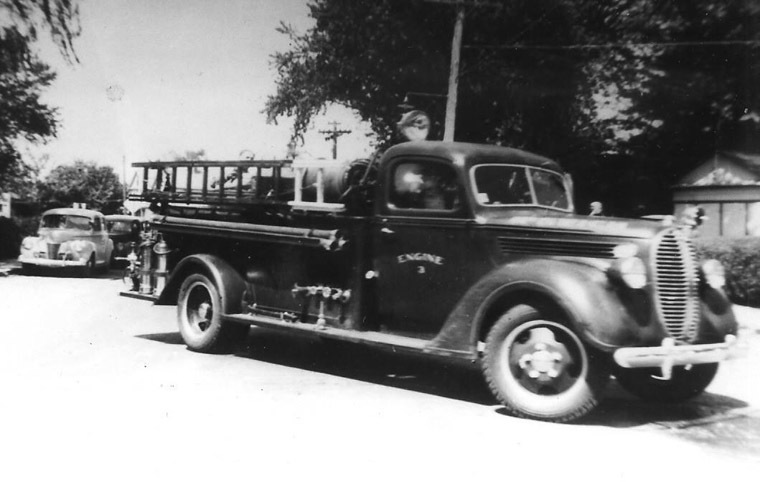 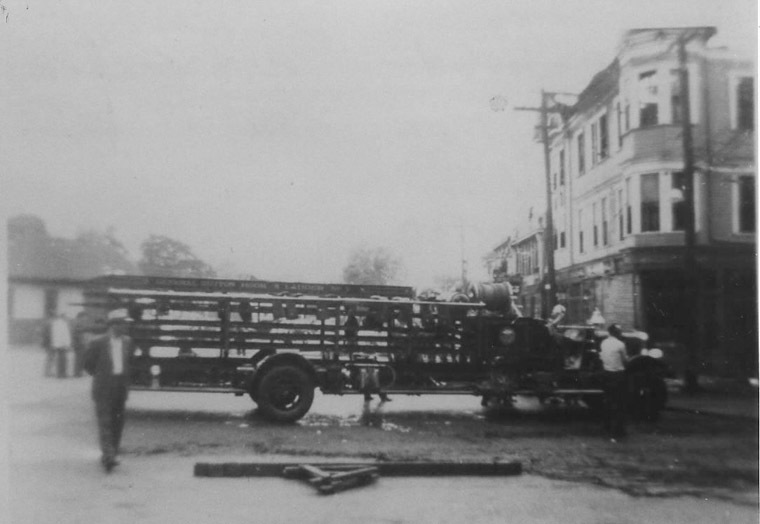 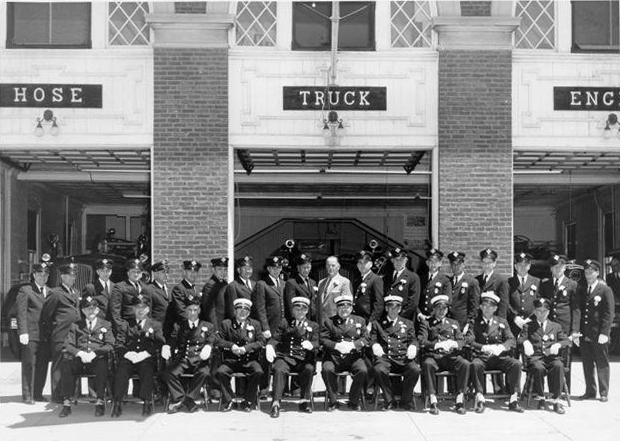 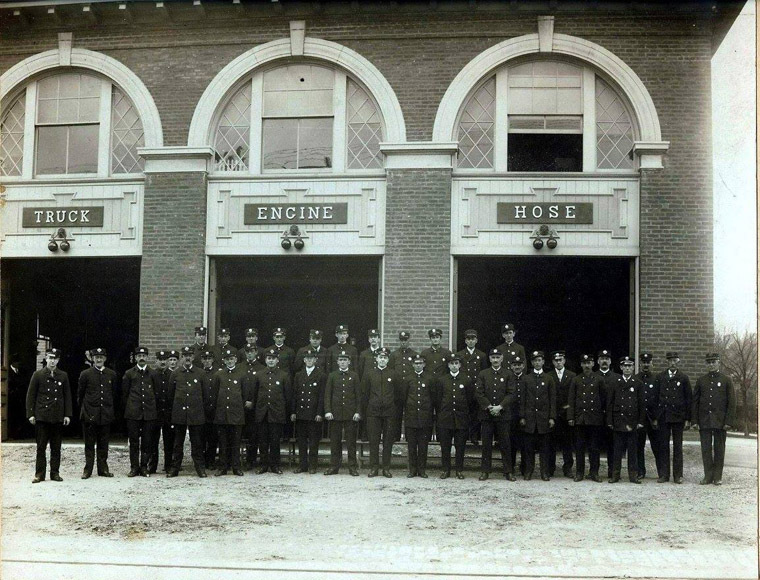 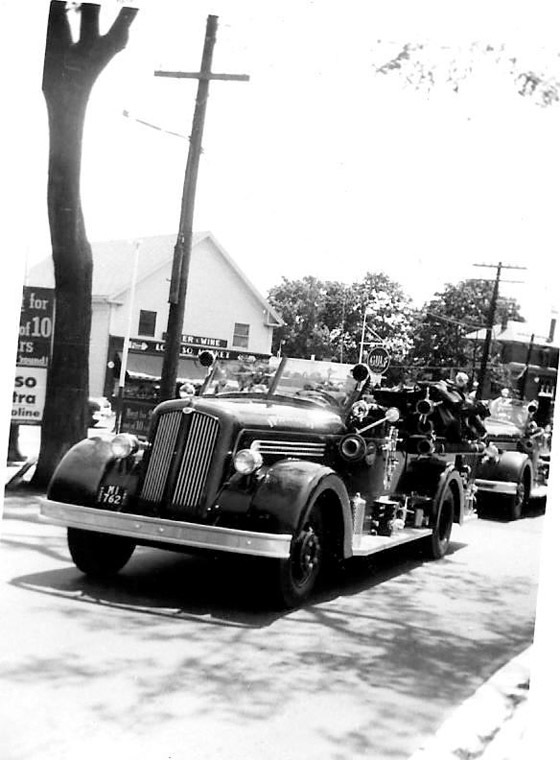 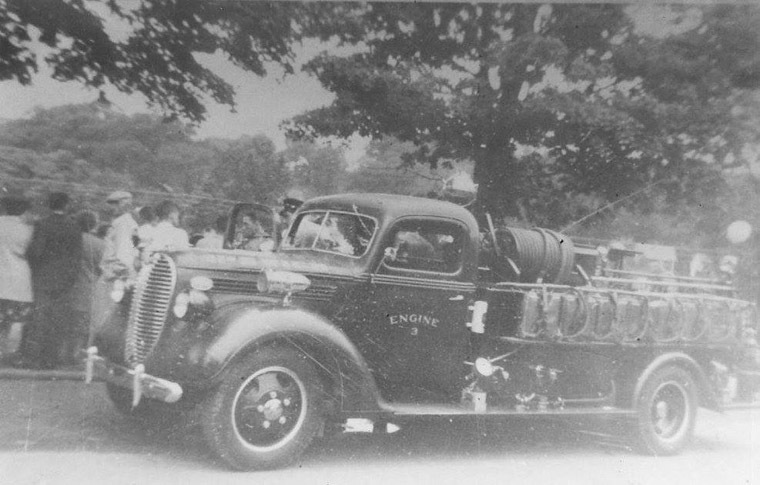 The Ipswich Museum provided this photo of firemen in front of the Ipswich Fire Station in 1948. 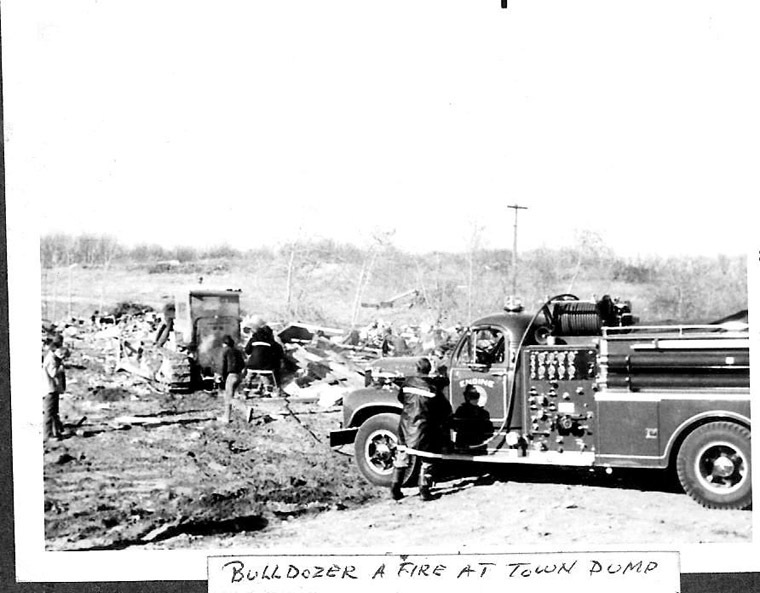 The flooring store that burned in the winter of 2015 is on the left. 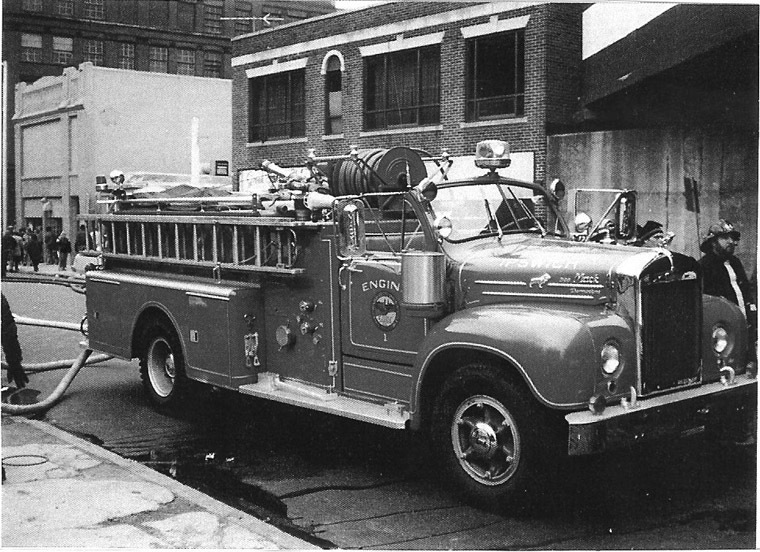 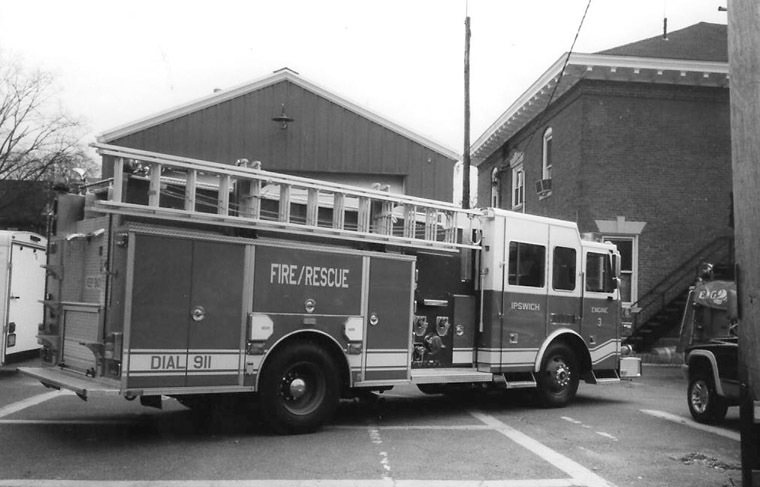 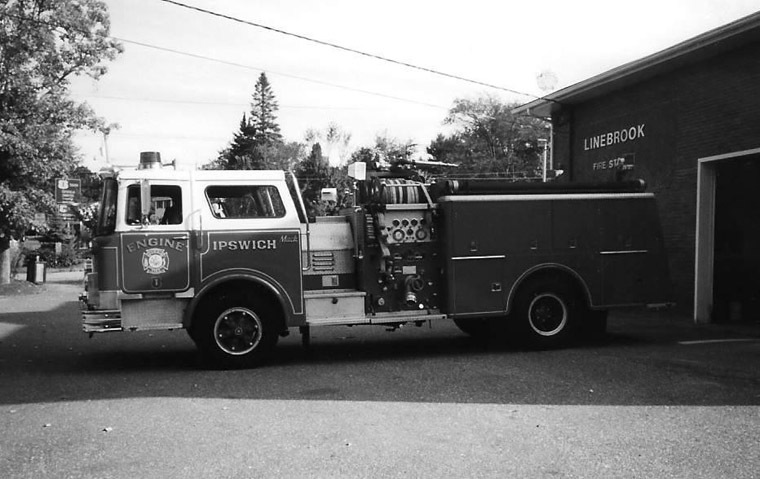 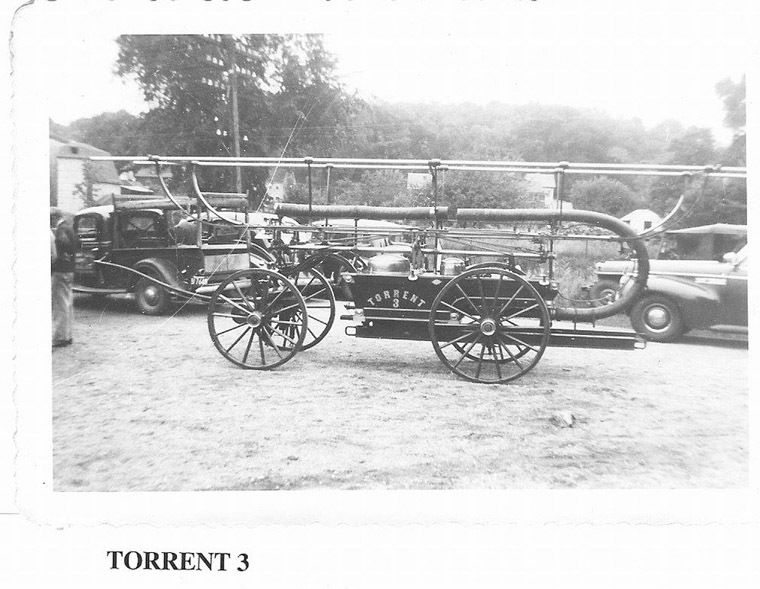 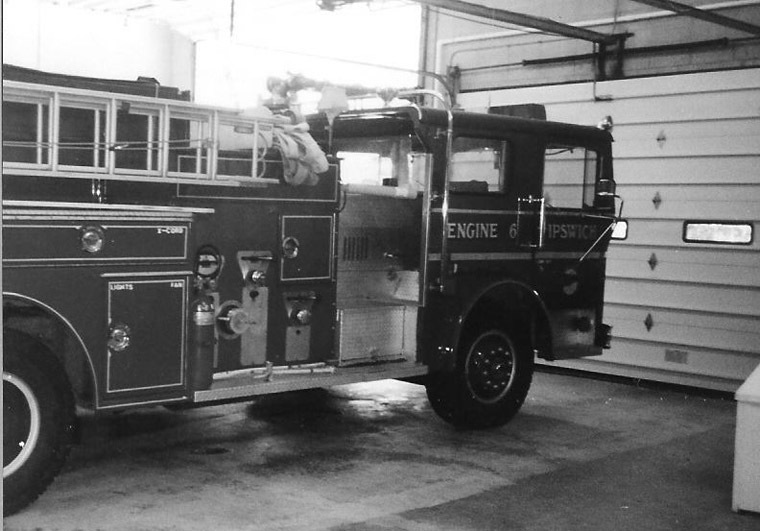 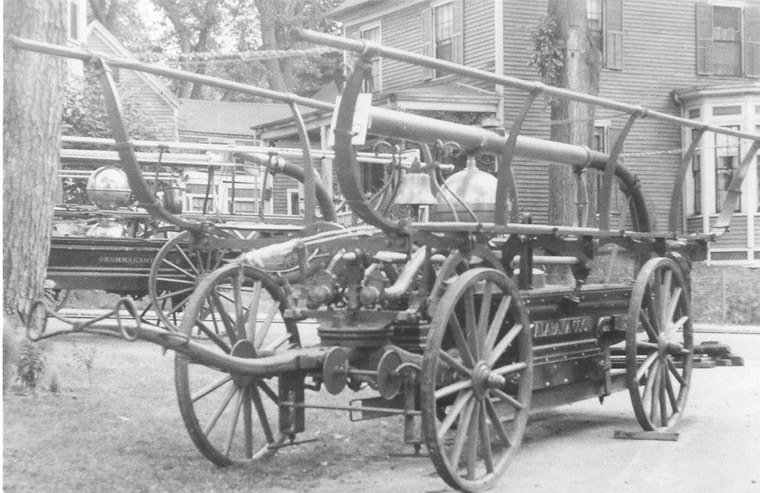 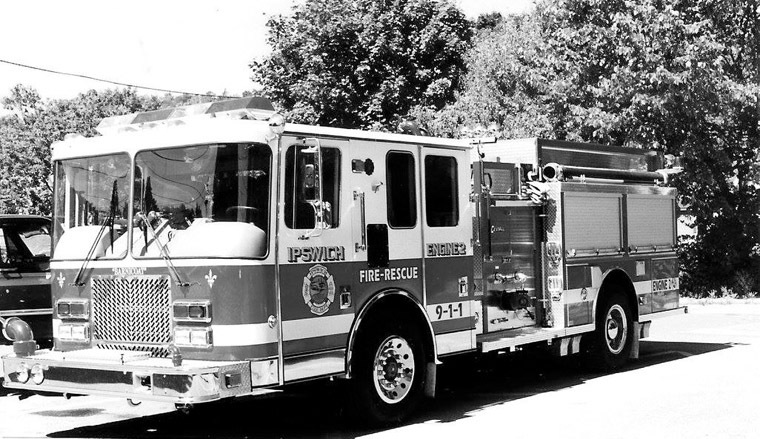 The Selectmen of the town of Ipswich submitted a plan at the 1953 annual Town Meeting to extend the Central Street fire station, which was built at the beginning of the 20th Century. 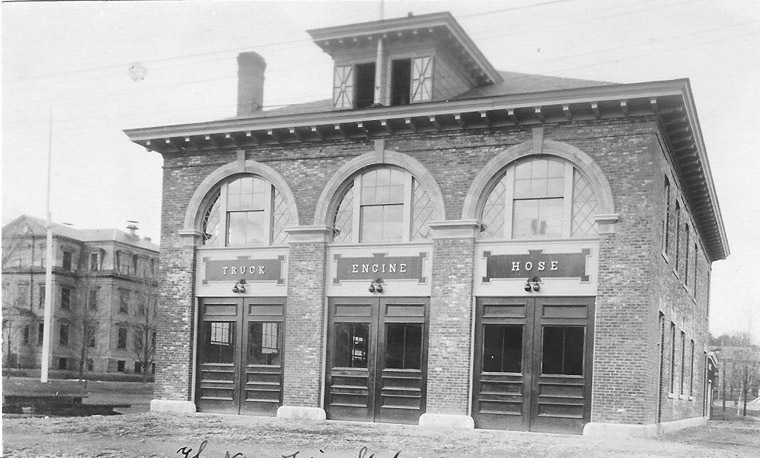 The plan included offices for police, parking for cruisers and ambulances, and a 22′ x 34′ court room for the Clerk of Courts. 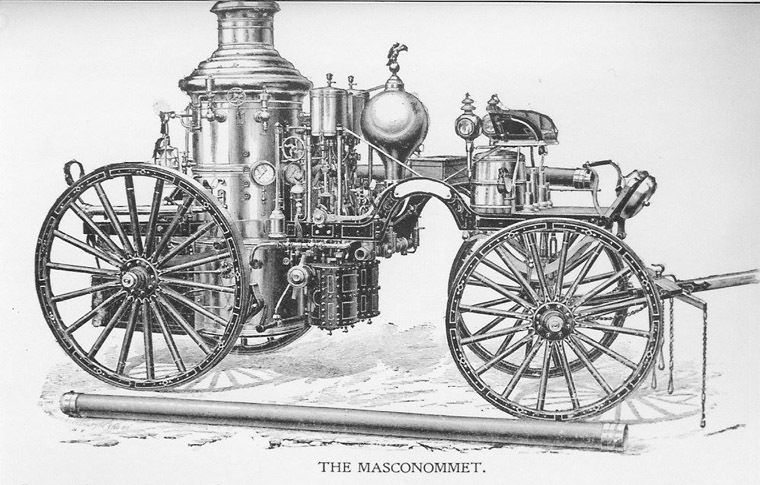 The estimated cost was $77,000, and it was rejected. 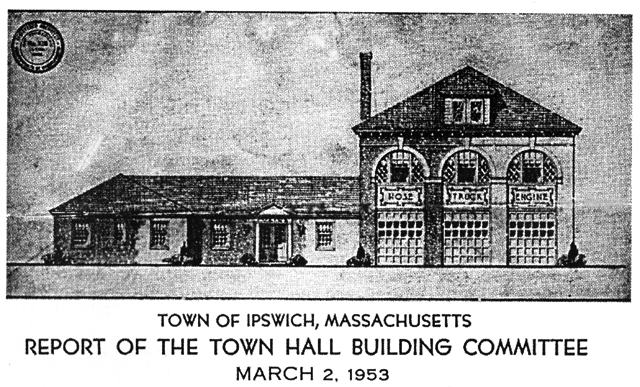 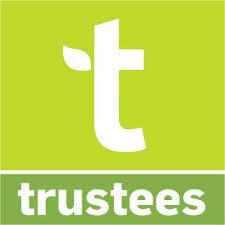 Sixty-one years later, the 2014 Ipswich Town Meeting rejected a study for combined facilities on Elm Street. 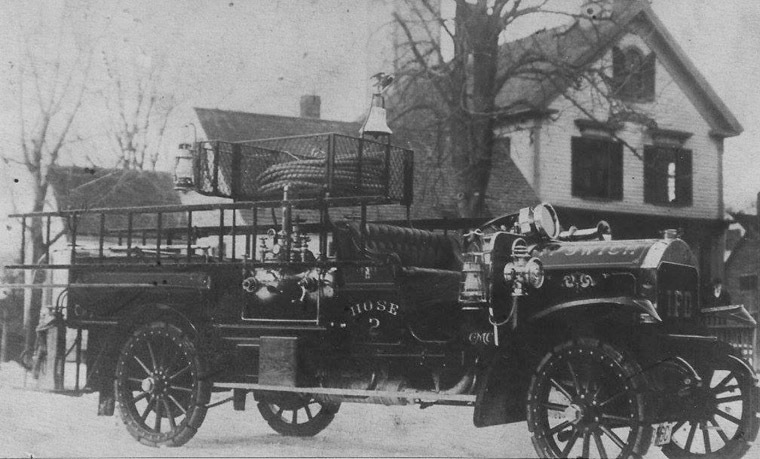 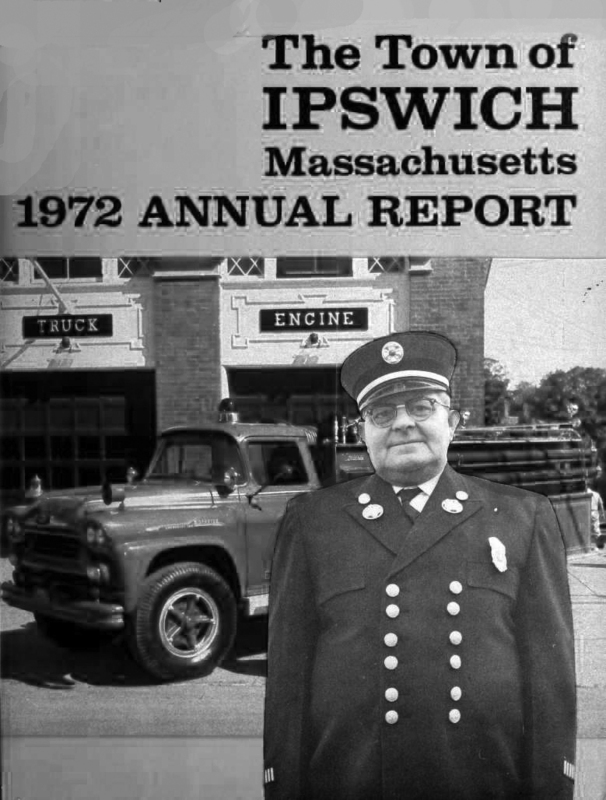 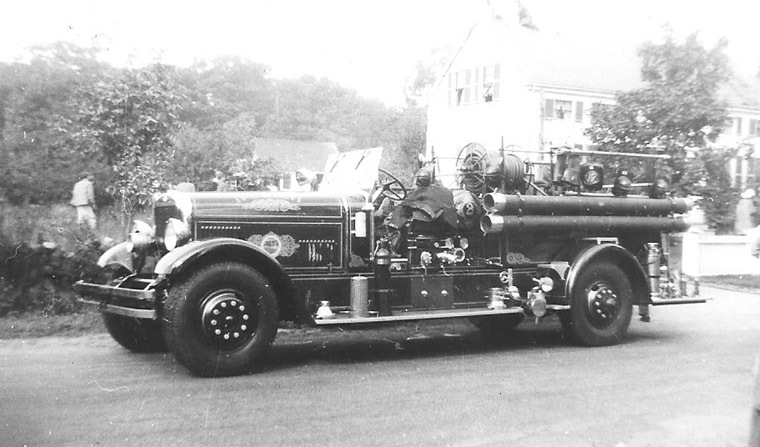 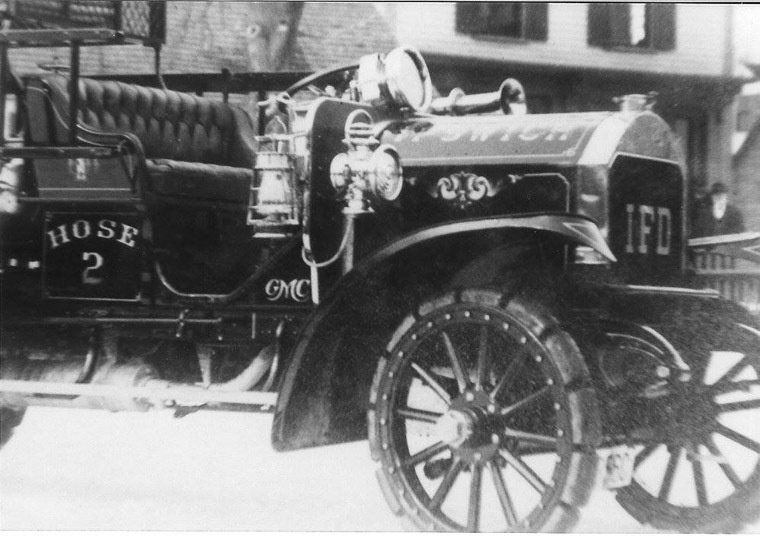 Born across the street from the fire station, it must have seemed prophetic when the late chief donned a miniature uniform as fire department mascot in the 1920’s to sit in the lead engine in Ipswich parades. 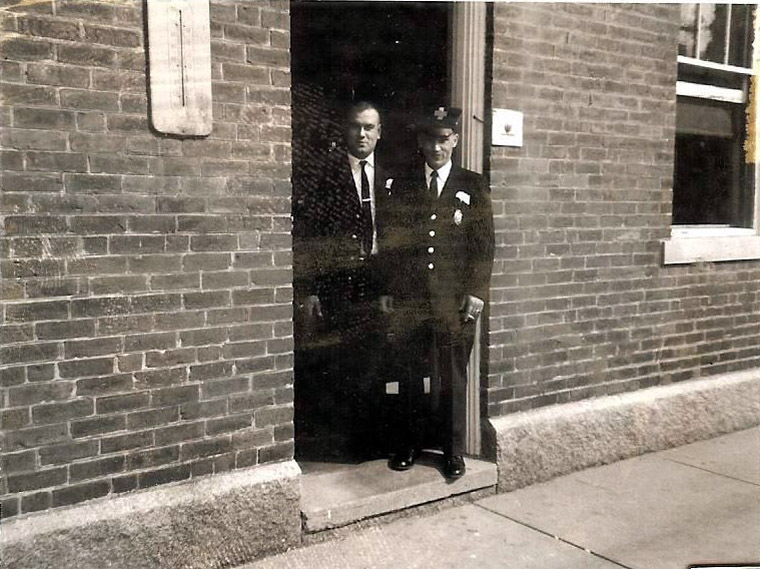 In 1956 Frank O’Malley tapped Mr. Scahill on the shoulder and told him he had been unanimously elected fire chief by the board of selectmen. 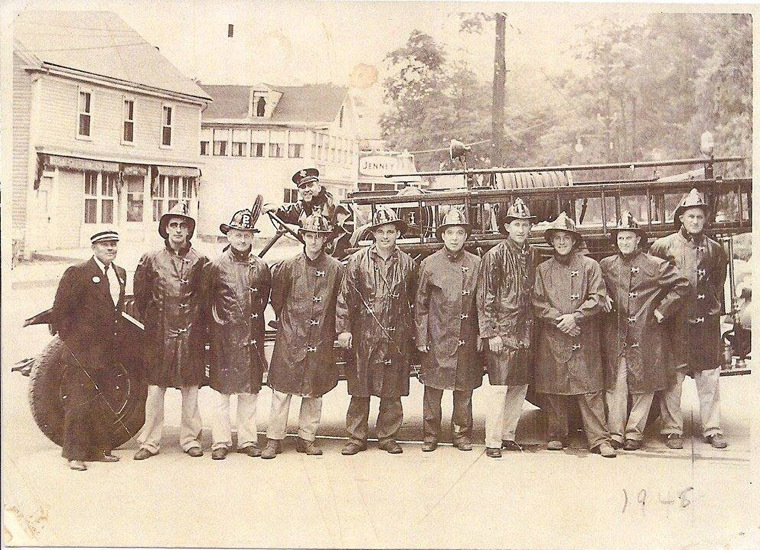 Photo courtesy of Buddy Scahill’s granddaughter Karen Stiles. 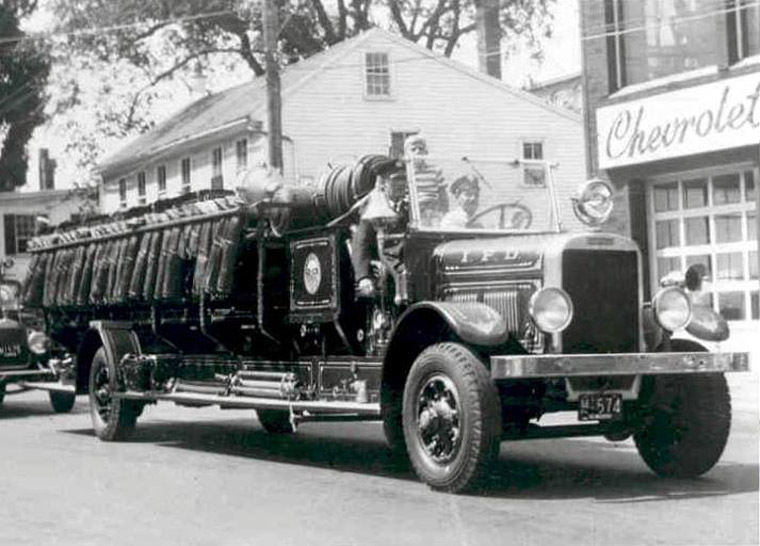 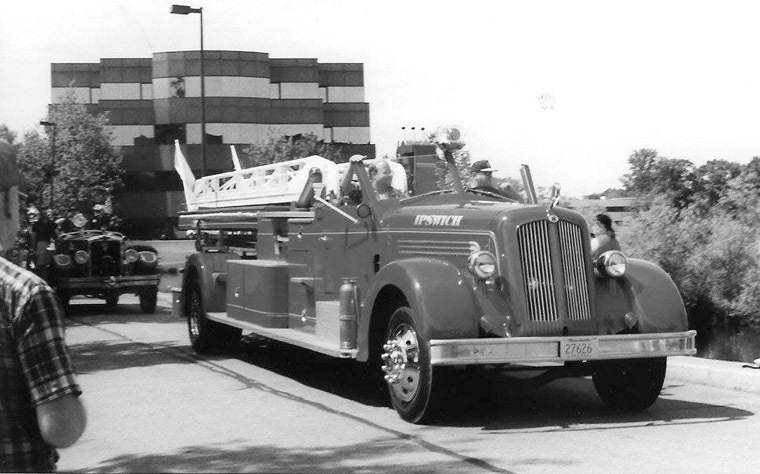 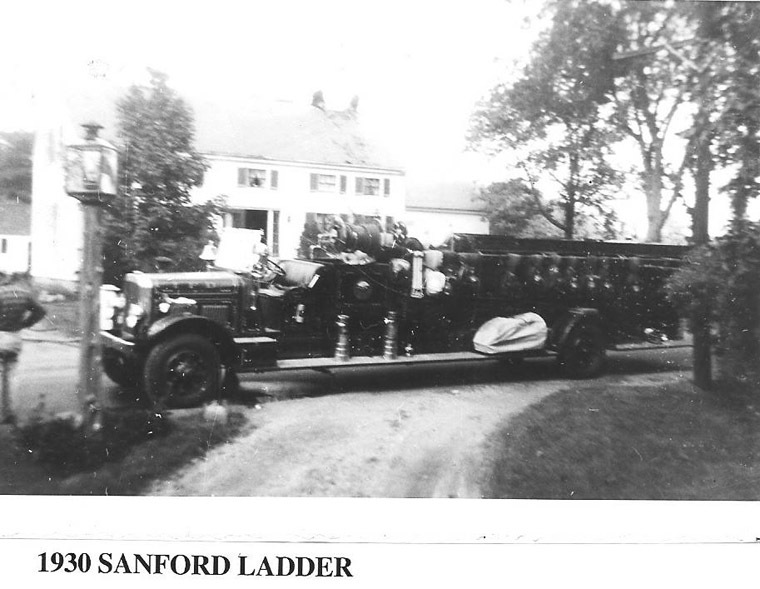 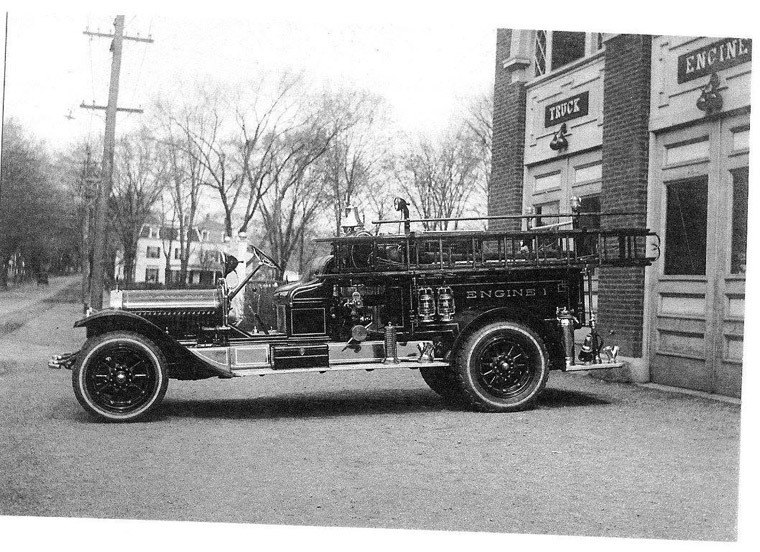 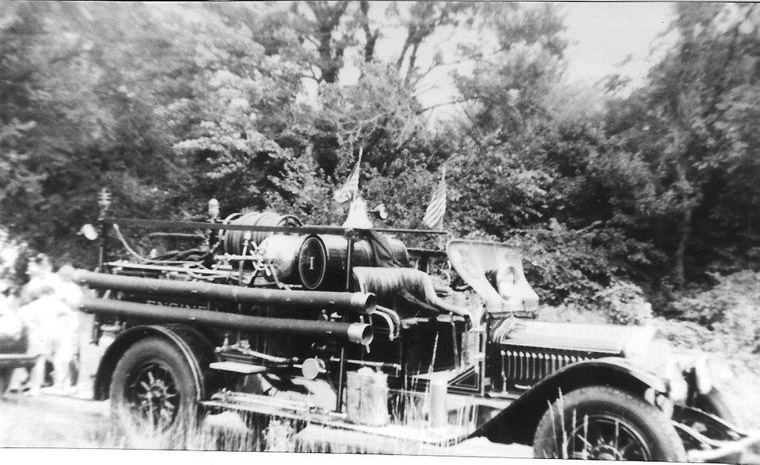 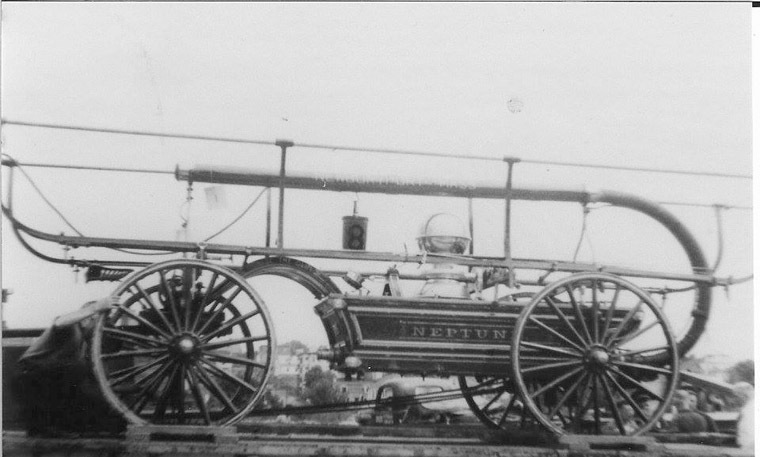 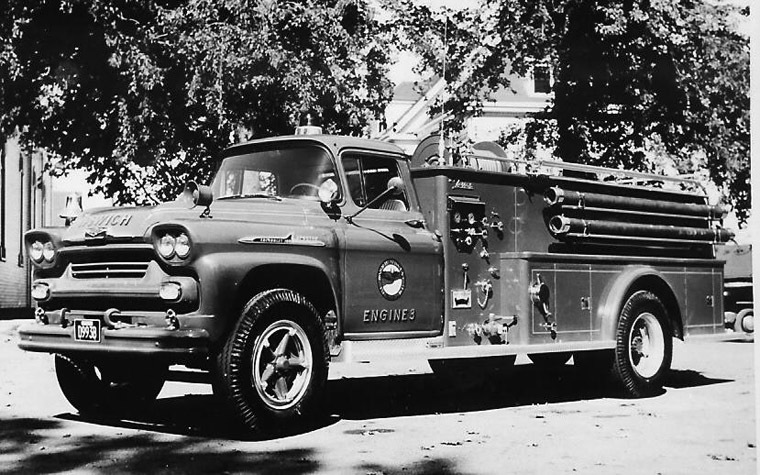 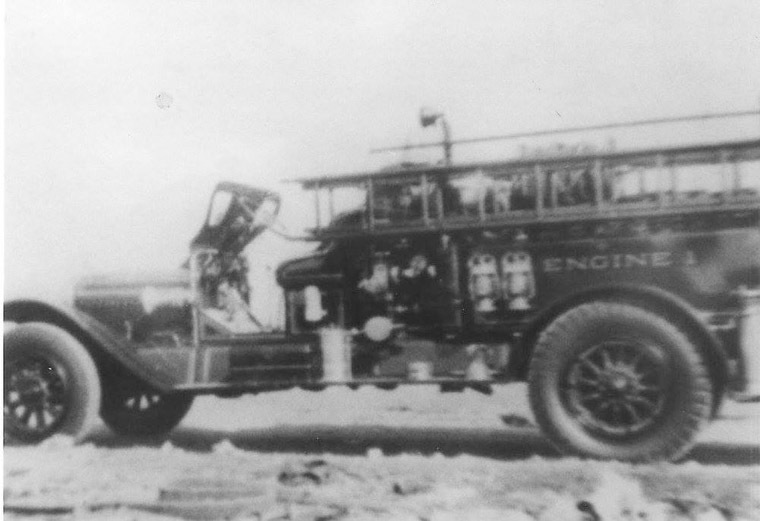 In the early part of the 20th Century, “Buddy” Scahill was the Fire department mascot. 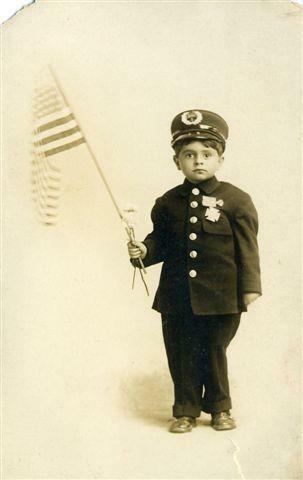 He went on to become Chief Scahill. 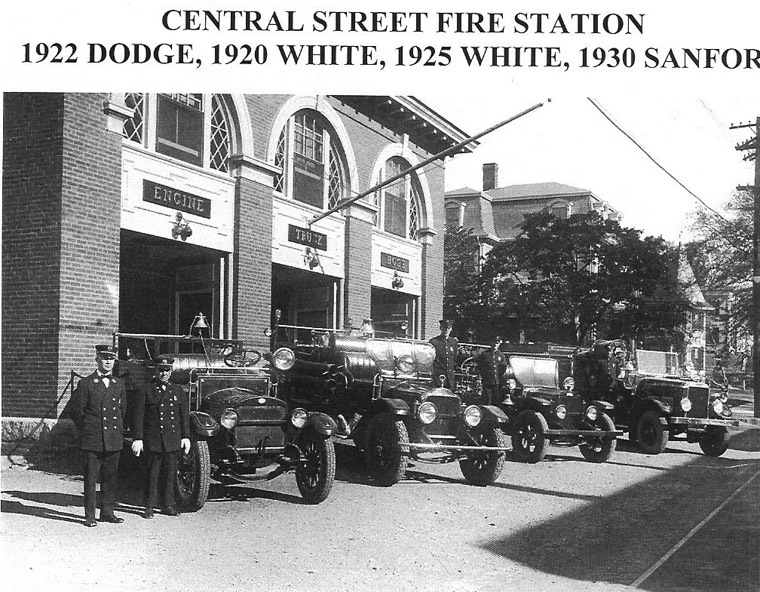 Photo courtesy of Karen Stiles. 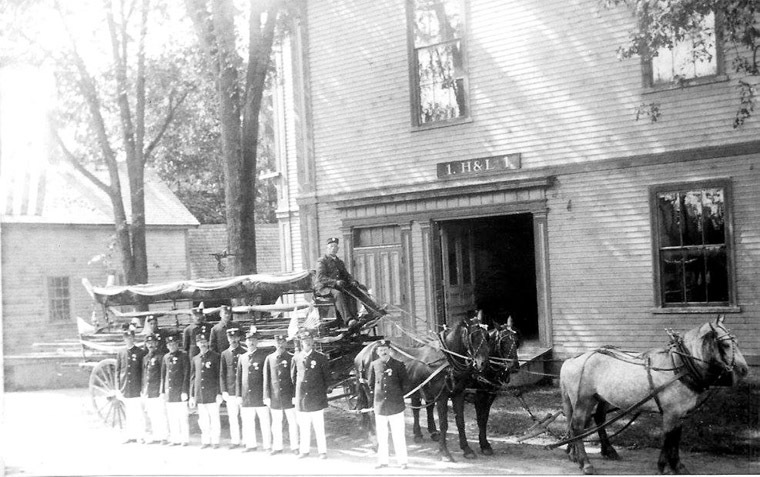 An indication of the esteem in which his fellow townsmen held him came when the town meeting voted Chief Scahill life-time tenure, something the town had not seen fit to confer on any other official. 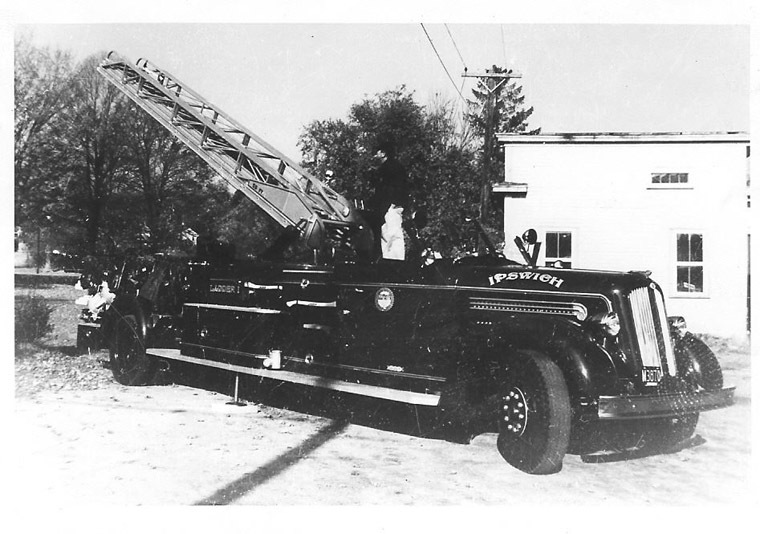 It was an appropriate honor for a man whose life revolved around service to the town for 43 years as a member of the forestry department, the water department, the highway department, and for 31 years, the fire department. 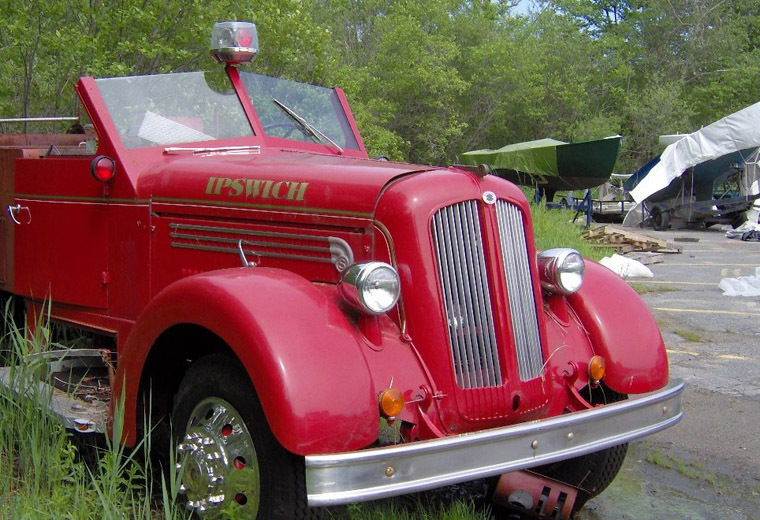 Be it enacted as follows: The tenure of office of Russell L. Scahill, incumbent of the office of chief of the fire department of the town of Ipswich, shall be unlimited. 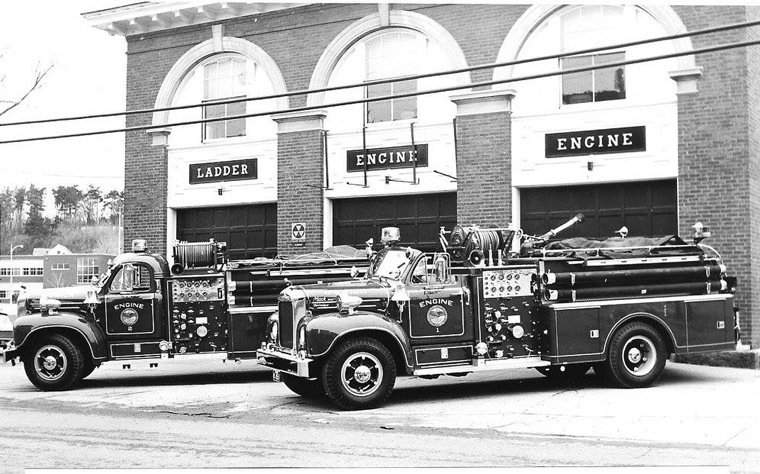 Approved at Town Meeting, February 11, 1963. 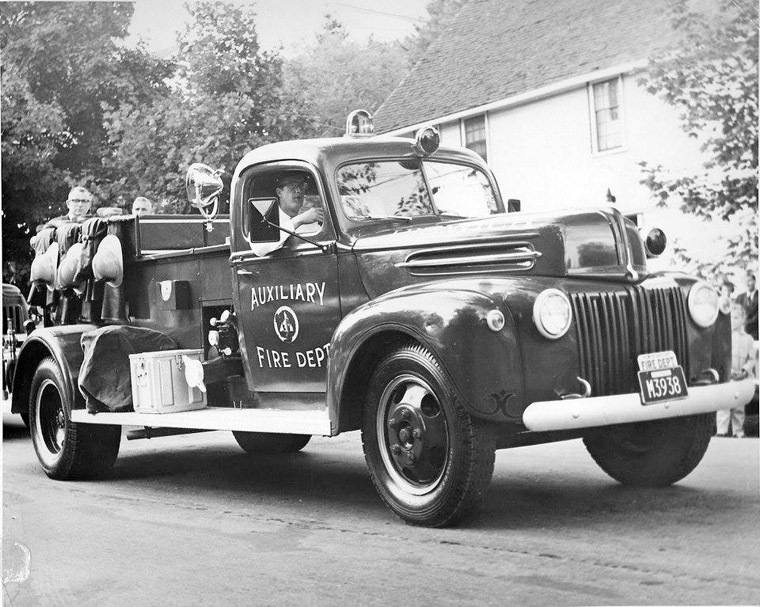 “Buddy” Scahill did what he wanted to do most, and he did it to the best of his ability – at any time of day or night. 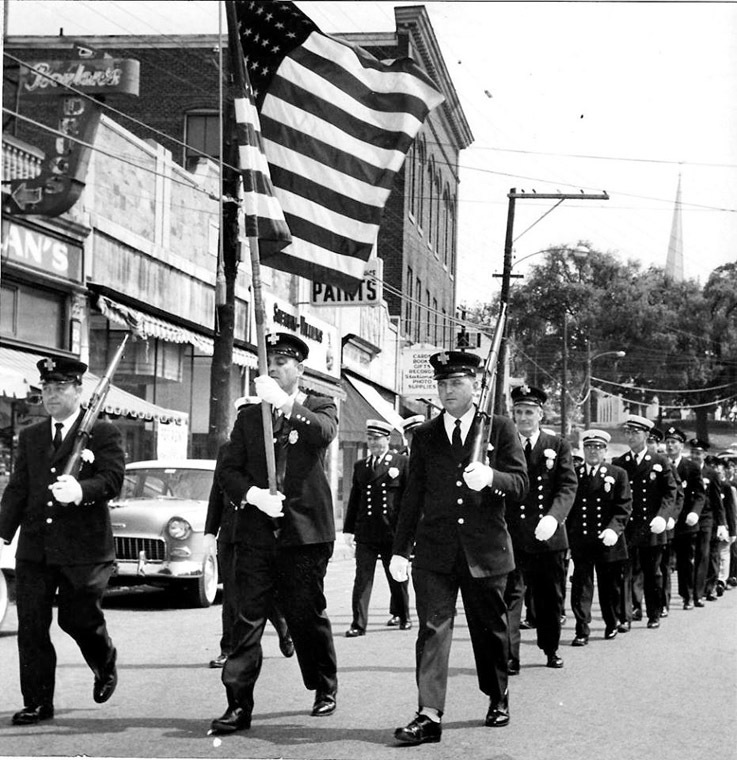 For little boys who dream impossible dreams, the career of “Buddy “Scahill should provide hope.